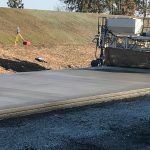 Scope of Project: As a subcontractor, Golden Triangle will be placing over 265,000 SY of concrete roadway pavement and cement treated permeable base course for the new SR576 toll road between SR22 and I79. 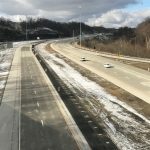 Scope of Project: The complete reconstruction of the SR70 @ PA 31 Interchange which includes over 140,000 SY of concrete roadway pavement and cement treated permeable base course. 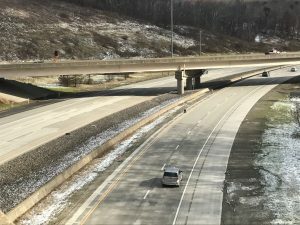 Scope of Project: The complete reconstruction of I376 (Parkway West) from the Pittsburgh International Airport to Business 376 which includes over 210,000 SY of concrete roadway pavement and cement treated permeable base course. Cement stabilization was used to treat the subgrade. 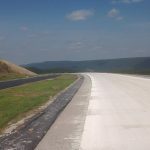 Scope of Project: The project included the placement of a 6” unbonded concrete overlay and new concrete shoulders on SR 30 and replacement of full depth concrete pavement on SR 2. 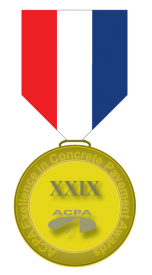 This project has been awarded SILVER in the “Overlays, Highways” category for ACPA’s 29th annual “Excellence in Concrete Pavement” Awards. 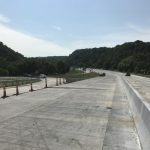 Scope of Project: The complete reconstruction of the Bentleyville Interchange on SR70 which includes over 90,000 SY of concrete roadway pavement and cement treated permeable base course. 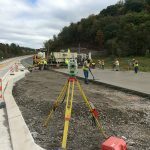 Scope of Project: The complete reconstruction of US119 in Westmoreland County which includes over 190,000 SY of concrete roadway pavement and cement treated permeable base course. Cement stabilization was used to treat the subgrade. 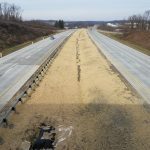 This project has been awarded GOLD in the “Divided Highways-Rural” category for ACPA’s 29th annual “Excellence in Concrete Pavement” Awards. Scope of Project: As a subcontractor on the New Stanton Interchange on SR70, Golden Triangle placed over 95,000 SY of concrete roadway pavement and cement treated permeable base course. In addition, 3 concrete roundabouts were placed along with various concrete curbs and gutters. 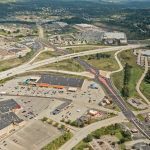 Scope of Project: The complete reconstruction of I70 and I79 at the Murtland Avenue Interchange in Washington County which includes over 110,000 SY of concrete roadway pavement and cement treated permeable base course. 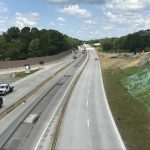 Scope of Project: This award winning project involved 4.1 miles of unbonded concrete overlay 24’ wide, reconstruction of shoulders and drainage, guide rail, median upgrade, rock fall area improvements, signing, pavement, marking and other miscellaneous construction. Scope of Project: This project included reconstruction of 4” cement treated free draining base, and 10” non-reinforced concrete pavement.